Chef Lucy Saunders demonstrated a recipe from her cookbook -- The Best of American Beer and Food --live, this morning on WUSA TV9, the CBS affiliate in Washington D.C.
During the segment, host Mike Walter interviewed both Ms. Saunders and Clipper City's Hugh Sisson. I was there ... on the other side of the camera. Is "beer the new wine", Mike asked Hugh? 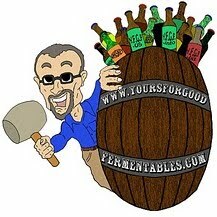 Hugh, not only owner of Clipper City Brewing, but a co-host of Cellar Notes, a Baltimore radio program on wine (! ), answered, "Yes!" 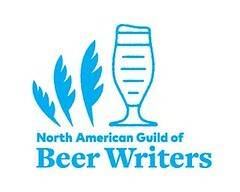 Beer has a food-worthiness, that is only now being formally recognized. From her book, Lucy prepared Creamy Cavatappi with Mushrooms and Fennel. She explained that the fennel, with its anise-like character, was a good match for some of the yeasty fermentation character of the Clipper City Pale Ale. Indeed, she said she finds fennel to be a good choice for many American Pale ales. Mike Walter and co-host Andrea Roane agreed, as did most of the members of the news staff and crew. 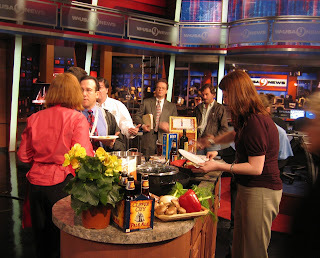 After the broadcast, they gathered around, to try more of the Cavatappi. And this was at 10am! Find the recipe on WUSA's website.